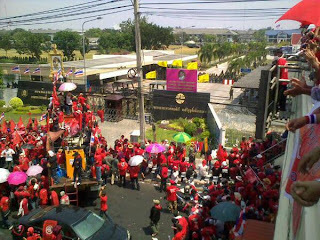 After the Bangkok Post had kindly called the protestors of the United Front for Democracy against Dictatorship (UDD) “red rage” and “rural hordes,” I decided to pay a visit to the protest site on Monday, 15 March 2010. When I arrived at the UN building at around 16:30, a speaker announced that there would be a “people’s war.” However, the number of troops seemed insufficient for this purpose. Surely, the sight of all the people, who had turned much of Rajadamnoen Avenue into a huge market place, was impressive. Moreover, this gathering certainly was a great exercise in political identity building, education, participation, and empowerment. People even lined up with filled-in forms to have their pictures taken for a computerized database of UDD members. But if I had been the prime minister, I would not have been shaken. Al Jazeera television reporting live that rural protesters are "swarming" an army base just outside Bangkok where Prime Minister Abhisit was holding out. Abhist recently departed the base by helicopter. Word is that he will return to the base, as he is surveying the protests from the air. The Red Shirts have demanded that the government meet a 12:00pm deadline to "dissolve parliament." Failing that, they promise "widespread disruptions," consisting of protests at "several key locations in the capital." There are at least 7,000 troops in the base. Most soldiers on the front line at the base are only armed with "riot gear." AP reports that Abhisit rejected the protesters' demand on national television. Wayne Hay, the Al Jazeera correspondent reports (at 12:00pm BKK from the army base) that speakers have been set up outside the army base, broadcasting songs from the Northeast of Thailand -- where many of the protesters live. Hay says the protesters don't seem to have any intention of taking over the base (which would be extremely difficult). Let's check out who is live-blogging the protests and what they are seeing. Off to join the convoy. 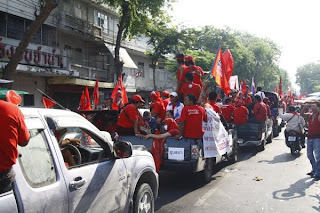 Red shirts are trundling up the road from Victory Monument in strength heading for the 11th Infantry Regiment HQ where the government's "war room" is located, run by PM Abhisit Vejjajiva, DPM Suthep Thaudsuban and army chief gen Anupong Paojinda. . . . I am amazed by the support on the street for the red march. Thousands of people cheering the convoy on. Women on the street yelling "I love Thaksin! I love Thaksin!" "When Thaksin was here, everybody had money in their pocket." redshirt quote. See previous HT. redshirt in truck..."Thaksin is the best Prime Minister Thailand has had." People in the street passing us food and water as we move down in the red shirts. "80% of police are red shirt" Quote from woman at the reds' march.
. Newley Purnell, Newley.com, Red shirt protests: images from Sun. and Mon. On way to 11th infantry brigade. 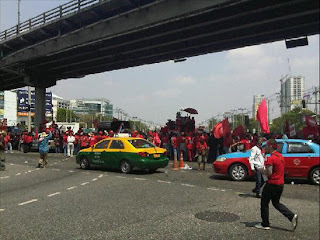 Red shirts' convoy being greeted by onlookers like victory parade. Now a huge dancing party at Kaset intersection, despite the 11th r speech's more serious tone. At Major Ratchada mall now, past Lat Phrao MRT. Thousands in the street supporting the red shirts. 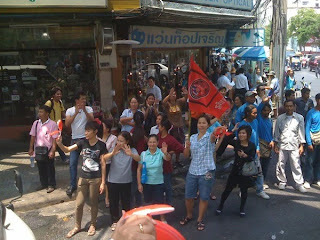 Red shirts taking over Lat Phrao in both directions now, tons of support on the streets 'I love you!' they are yelling. (12:25) Just watched CNN update. Dan Rivers seems to lean towards the yellow position: Thaksin runs the whole movement--the puppet master with the money bags; protesters are there for money not democracy. . .
2pm : The red shirts disperse and return to Pan Fah Bridge. 1.30pm : Nuttawut Saikua, a red shirt leader, announces that a total of three million cc of blood will be taken from one million red shirts tomorrow. If the prime minister still refuses to dissolve the House, the blood will be poured at Democrat Party, the Government House and the PM's residence.